Florence weakened to a tropical depression Sunday, but that is cold comfort to residents in North Carolina who have seen over 2 feet of rain and are now battling major-river flooding and possible tornadoes. "Flood waters are still raging across parts of our state, and the risk to life is rising with the angry waters," North Carolina Gov. Roy Cooper said at a midday news conference. He added that "this storm has never been more dangerous than it is right now" in certain areas of the state. Some parts of the state were getting 2 to 3 inches an hour, Cooper said. (AP) A member of the US Coast Guard walks down Mill Creek Road checking houses after tropical storm Florence hit Newport N.C., Saturday, Sept. 15, 2018. A day after blowing ashore with 90 mph winds, Florence practically parked itself over land all day long and poured on the rain. "That's enough to cause flooding in areas that have never flooded before until now," Cooper said. 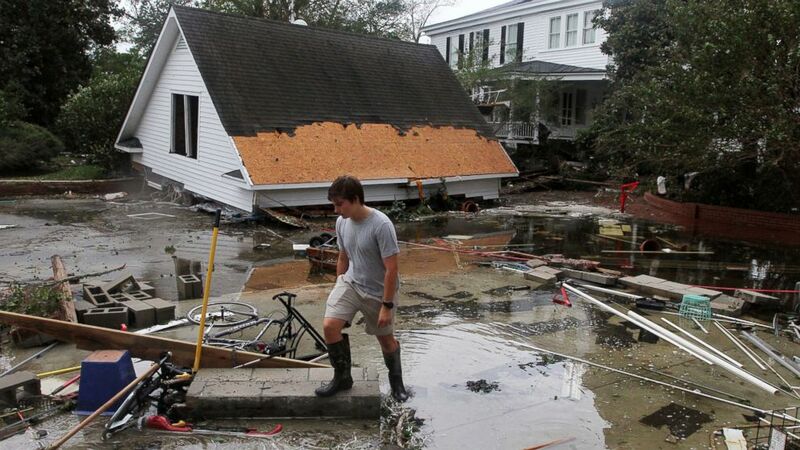 Since the storm made landfall as a hurricane in North Carolina on Friday morning, it has been blamed for 16 deaths. Officials said at least 17 people have died in both states. The death toll included a person killed Sunday in a pickup truck crash near Gilbert, South Carolina, that occurred when the motorist drove through standing water on a roadway, according to the South Carolina Department of Public Safety. Hundreds of people have been rescued by local authorities, Cajun Navy volunteers and the U.S. Coast Guard since Friday morning. 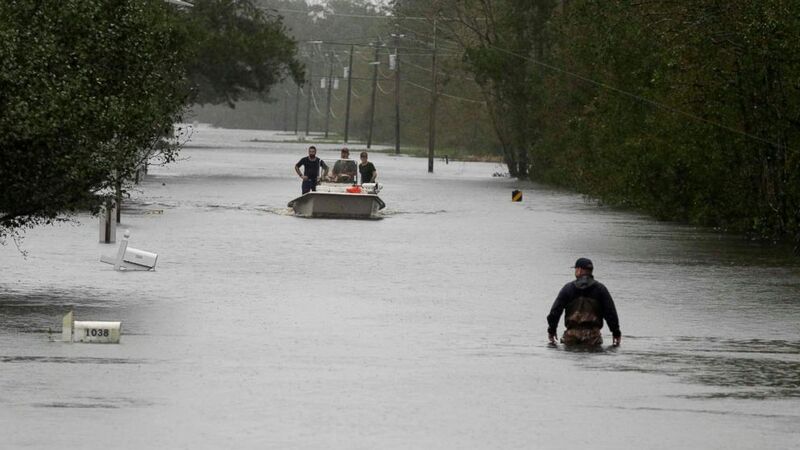 New evacuation orders were issued Sunday for a mile-long area along the Cape Fear and Little rivers in North Carolina. More than 700,000 households and businesses in the state were still without power as of Sunday afternoon, an estimated 15,000 people were in shelters, and 171 primary roads were closed including parts of two interstates, authorities said. The state Highway Patrol advised people to stay off the roads, saying troopers responded to 48 collisions from Saturday night and into Sunday morning. Adding to the threat of further flooding, a tornado watch was in effect for most of Sunday for the areas of Wilmington, Fayetteville, Myrtle Beach, Jacksonville, Oak Island, and Florence. "It's bad right now, and we do expect it to get worse over the coming days," Michael Sprayberry, director of North Carolina Emergency Management, said on ABC's "This Week" Sunday. "We know that's going to be a major mission going forward because this is historic and unprecedented flooding." 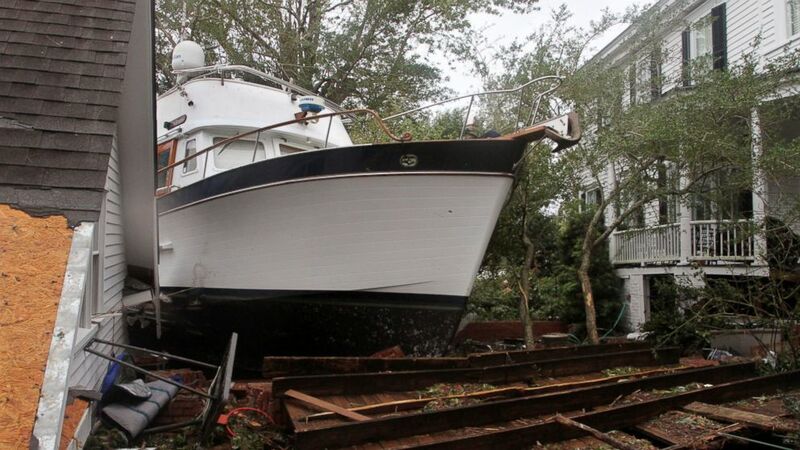 (AP) A 40-foot yacht lies in the yard of a storm-damaged home on East Front Street in New Bern, N.C., Saturday, Sept. 15, 2018. The boat washed up with storm surge and debris from Hurricane Florence. Catastrophic flooding unfolded Sunday morning in parts of North Carolina, exceeding flooding 19 years ago in Hurricane Floyd. the National Weather Service said. One waterway, the Cape Fear River, rose 15 feet in just 24 hours from early Saturday to early Sunday. It reached flood stage in Fayetteville, North Carolina, where mandatory evacuation orders were issued Saturday. "This will be very dangerous flooding over the next few days," the National Weather Service said in a tweet Sunday morning. The Coast Guard head echoed this view. "My biggest concern is the rising water," Schultz said on "This Week," noting that Wilmington, North Carolina, got 24 inches of rain and could potentially get 15 inches more. "We're looking at a high water situation," he said. "The rivers could potentially crest here into the early part of this week. So, we have not seen the worst of the flooding." Schultz was among the emergency officials who briefed President Trump on the storm on Saturday. "We talked about the massive risk the storm poses, catastrophic flooding, prolonged flooding," he said of the briefing. "We gave him an update on response capabilities in the theater and the president is completely leaning in. Anything the feds need to do to support the local, the state partners here in South Carolina and North Carolina. We feel fully supported." 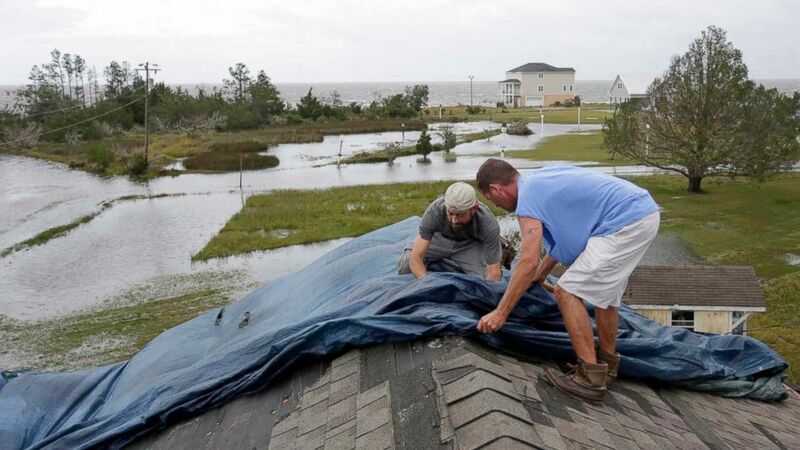 (AP) Jeff Pyron, left, and Daniel Lilly cover Lilly's roof after Hurricane Florence hit Davis N.C., Saturday, Sept. 15, 2018. The town had 4 1/2 feet of storm surge. "I had my house raised for Irene cause I got flooded from the bottom, now i'm getting flooded from the top," Lilly said. The Lumber River, near Lumberton, North Carolina, rose to into major flood stage Sunday. It is expected to reach a level very near the record Hurricane Matthew set in 2016. Mandatory evacuations were issued for South Lumberton on Saturday. Major river flooding is also expected on some rivers from southern Virginia to northern South Carolina. The Northeast Cape Fear River, near Chinquapin, North Carolina, will rise above record flood levels set by Hurricane Floyd in 1999. This will cause devastating flooding across much of Onslow County with travel made impossible and many homes completely flooded. The Neuse River, both near Goldsboro and Kinston, North Carolina, will reach major flood stage late Sunday and into Monday. The Waccamaw River, near Conway, South Carolina, will rise near record levels by the end of the week. Florence has dropped a tremendous amount of rain in eastern North Carolina, with a widespread 20 to 30 inches reported already. Radar is estimating that some areas between Wilmington and New Bern, North Carolina, have received over 30 inches of rain. Florence is now the third storm to set a tropical cyclone state rainfall record in just the last 12 months. Harvey dropped 60.58 inches of rain last year in Texas, setting the state’s new record. Lane just last month dropped 52.02 inches of rain in parts of Hawaii, breaking the state record. The 30.59 inches that have fallen in Swansboro sets a new record for North Carolina. Florence also currently stands as the sixth-highest tropical cyclone rainfall total across the U.S. for records dating back to 1950. Heavy rains bands are still coming onshore in eastern South Carolina and North Carolina on Sunday morning. Some of the heavier bands have shifted toward Fayetteville, Charlotte, and Raleigh. Torrential rain is causing inland flooding with major roadways, including large portions of I-95, closed. An additional 6 to 10 inches of rain is still possible along the southeast border of North Carolina and South Carolina. Life-threatening, catastrophic flash flooding is likely over the southern to central Appalachians from western North Carolina into western Virginia and eastern West Virginia. Torrential rain will cause flash flooding and increase the risk of landslides in the higher terrains. (AP) Resident Joseph Eudi looks at flood debris and storm damage from Hurricane Florence at a home on East Front Street in New Bern, N.C., Saturday, Sept. 15, 2018. Florence is still moving very slowly inland. The track shows Florence moving west through Sunday, and then gradually turning north by Monday. Florence will likely become a remnant low within 36 hours. Even though Florence is weakening, it will still bring significant rainfall inland to the Appalachians before moving toward the Northeast on Tuesday. Totals could exceed 4 inches locally for inland New York and Massachusetts. "People need to heed the warnings from their local emergency management experts and stay in safe ground," the Coast Guard's Adm. Schultz said.